Evolved Dark Caster is Live! Dage's Darkest Gift Arrives Tonight! Dage has one last birthday gift for you, Heroes: the Evolved Dark Caster CLASS! This thing is BEASTLY, both in terms of incredible art AND with a new combination of skills by a mysterious new class designer known only as a "Friend of the Underworld." Every skill in the EDC is Magical, and you'll gain mana from all hits landed in combat (especially on crits)! So if you like to hit hard and hit often, this is the one you're going to want to equip. But don't neglect your HP, because the amount you deal will depend on how much health you've got left! The Class costs either 2000 AdventureCoins OR 2000 Legion Tokens. 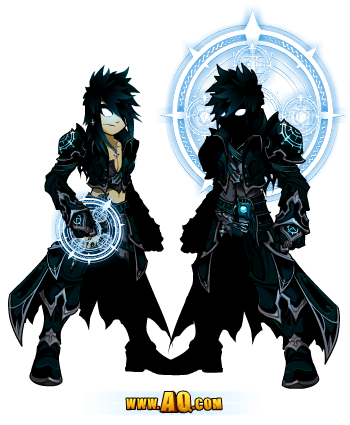 The Armor, helms, cape, chakram, and spellblade each cost less, but all are available either for ACs or LTs. The Evolved Dark Caster will NEVER return, though Dage plans to release a different Dark Caster version for NEXT year's birthday. Evolved Dark Caster Skills Breakdown! This class is like a jack-of-all-trades; it’s good at something, but not an expert on all fields. Now this class is still quite powerful, and it’s worthy of belonging in Dage’s Legion. With this kind of set-up, you can keep yourself and allies alive to drag your enemies into the Underworld’s chasm of darkness. Notes: You do NOT need the Evolved Dark Caster armor to unlock the Class. Overshadowed debuffs your enemy to improve your survivability. Your target becomes slower and lands less hits on you, so make these stacks count. This skill deals some heavy damage to your targets, and it’s pretty useful for farming. The short cooldown time lets you keep on attack, but watch out for the mana cost. Stygian Pact is support for you and your fellow Legionnaires to keep on fighting. It prevents you and your allies from crossing over the River Styx and owing Death another favor. Overshadowed, Onyx Combustion, and Stygian Pact were partially made to stall and keep you alive in combat, so you can let loose Soul Scourge to finish the job. I’m hoping to see players come up with different ways to use this class in PvP and against monsters. The skills are pretty straightforward, so it won’t be hard to use. Now this is the first rank 4 passive to permanently buff a Mage-based class’s dodge rate. The increase in crit rate and outgoing damage is to make sure your targets get hit hard. Soul Scourge can start your fights and end them with its guaranteed hit, nuke, and Decay effect. It’s much more effective when you get lucky and land a crit. If you hit more than one target with this attack, you’re likely to gain back most of your mana in an instant. The Decay effect will be extremely useful in PvP. Now this is some extra protection in PvP and against monsters, giving you the power of a Dracolich to defend yourself. Who is this new Class designer? Hailing from the savage depths of the Underworld, I am AQW’s new Class Designer who shall remain anonymous. Like Dage, I am a fellow resident of Underworld, so the realm of darkness is not something new to me. The endlessly dark and ominous atmosphere of the Underworld can drive the tortured souls and the newly deceased into insanity and ghostly turmoil, but you get used to it. You get to meet new people every day, if you get what I’m saying. OK, enough of my rambling, let’s get to the point of why you’re reading this. When Dage said he wanted Evolved Dark Caster to be a powerful, Mage-based class with AoE skills and good in PvP, I thought to myself, “No, let’s go beyond that. Make the class good for farming, group/boss fights, and soloing (to some extent). It will be a multi-purpose class!” Now let’s talk about the actual class. It won’t be hard at all to decide what enhancements to use because all the skills are Magical, including the Auto-Attack. The INT stat is your best friend. The mana regeneration is just like your regular Mage class, so it’s based on how hard you can hit your enemies, especially crits. So. My command to YOU is... Get the Class. Fight with it. Then report back to me on the forum to let me know what you think!